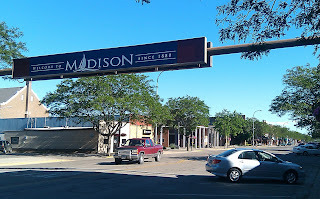 We closed at noon on our Texas home sale and courtesy of the supersonic speed of Internet Airlines, we moved to Madison, S.D. four hours later. Any thought by my wife that I am a procrastinator can now be laid to rest. Great neighborhood with a nice ethnic mix. While mostly white, there are a few browns mixed in, all different shapes and sizes. A few international visitors, too. Holidays will be very quiet, I mean really quiet. One of the real attractions-- Federal police protection. It's like living on an Indian reservation, without the alcoholics. No worries about sleepless nights, no barking dogs around here! Our monthly mortgage: $8. We felt it was a steal. And it includes utilities. Downsizing accomplished. 1,747 square feet was a bit too much for empty-nesters, so we are now minimalists-- new pad is 32 square inches. Parking can be a bear, especially early mornings and after school/work hours. There may be a few unwelcome guests, but most of the time they are simply lost. Landlords--what cantankerous and snarly folks! They're a bit like the Gestapo, all in their uniforms and such. That's right, we own ourselves a post office box in Madison, S.D.! I love cookie-cutter subdivisions. All perfectly legal as when you sell all your belongings, you get to decide what state you want to domicile in. We picked the RV-friendliest of them all. Why South Dakota you ask? 3% sales vehicle/RV sales tax (Texas 6.25%). No annual vehicle inspection/emissions required (Texas 1x per yr). Annual renewals can be done on line and are very affordable. The company we are using mydakotaaddress.com walks in your vehicle info. Once I buy the RV/truck in TX, I mail our service the docs, they mail me the plates. 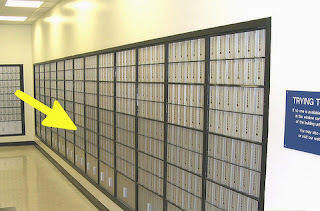 Mail forwarding can be provided if my in-laws tire of the duties. Cost: $8 per mo., plus postage on mail you decide you want forwarded. The ONLY time you have to appear in person is to get a SD Driver's License. It is $20 and all you do is take a vision test. pretty saavy moves there Hallock!